First of all, I’d just like to mention that Google’s logo imagery today is CREEPING me out. Seriously, what IS that? Wereclowns? Clowns are scary enough on their own—there is no need to give them fangs and red eyes. Sheesh. The day dawned clear, blue and brilliant, as most days in the Swiss Alps seemed to dawn (not that I ever saw the actual “dawn” … semantics). Amanda and I ate another fantastic homemade breakfast at the Posthotel Rossli, walked around Gstaad, said our farewells to one of the most magical places on earth (Walt Disney clearly wasn’t that well traveled) and headed off into the proverbial Italian sunset. The drive was just as incredible as everything else we’d seen that week—maybe even moreso. There were vineyards for miles and miles, surrounded by mountains, castles, and the bluest/greenest/cleanest lakes I’ve ever seen. I wanted to just jump out of the car and swim in each and every one of them. But I suppose that would’ve delayed our trip quite a bit, and we really wanted to get to Italy in a timely fashion, so I restrained myself. I approach the border security agent in my rental car, smiling like the naive tourist I am, passport ready and practically thrown out the window into the awaiting guard’s hands. He asks Amanda and I where we’re from and where we’re going, then takes our passports and goes into a building, where I imagine all the stamps sit on a shelf, and at that very moment, he’s taking one down, opening up my passport, and stamping the ink on it that will forever remind me of my first time in Italy. Visions of what the stamp will look like dance around in my mind, and I nearly jump out of the car to retrieve my passport from him as he exits the building. Once again, I show restraint, though, and patiently wait until he hands it back to me. I’m dying for him to go away so I can inspect the stamp, but he insists on standing there, chit-chatting as if he doesn’t have a care in the world and I don’t have a passport to inspect! He invited Amanda and I to come into his office and have a coffee with him and his friend, which we thought sounded fun, but c'mon man! Give a girl a minute!! Thankfully, I snuck away to the restroom ("water closet" in Europe-speak). I shut the door, pulled out my passport, and opened it, scanning the pages for the stamp that would forever commemorate this moment. I saw my four Mexico stamps first. Then I turned the page and saw my Switzerland entry stamp. Then I gleefully turned to the next page, and ...... nothing. I turned to the next page and the next and the next and …. NOT A THING. I learned two life lessons that day that will remain with me forever. One is that when traveling within the European Union, you only get one stamp per trip there, and it’s the stamp of the first country you enter from the United States. The second is to never let an opportunity pass you by. Why oh WHY didn’t I ask the flirty Italian border patrol man to give me a stamp in my passport?? Did he have the authority to do so? I don’t know, and now, I will never know, because I didn’t ask. Ah the sting of lifelong regret. Let this be a lesson to you, too. I pressed a green button to extract the ticket, as I would do at any toll post in the States. Then I waited for the gate to go up. But the gate didn't move. “Well, maybe we have to pay first,” Amanda and I thought. So we looked for a place to put money or a credit card. No such luck. There were several other buttons, though, so like a five-year-old on an elevator, I randomly started pressing all of them. One of them was a cry for help apparently, and a very annoyed-sounding voice came through the box. It said something in a language I didn’t know. “Please wait” was the response I got. So we waited … and waited, looking around for someone to come to our rescue. Five minutes later, no one had come to save us. So, I pressed the dreaded button again. “PLEASE WAIT! !” was the response. Five more minutes later, and we’re getting REALLY annoyed. A car is now behind us waiting, and I’m afraid I’m about to have a cap busted in me, but then I realize I’m not in America anymore, and I relax a little. People in Europe don’t seem to suffer from road rage quite like we Americans do. I press the button again, and still nothing. Finally, blessedly, we see a cop car park about 50 yards away. I thought maybe they were coming for us, but I didn’t care at this point. I mean, my grandpa LaRosa was born in Italy, so that has to count for something in the slammer, right?? Naturally, since I was in the driver’s seat and couldn’t abandon my post, Amanda was selected as the person to approach the boys in blue. Another veteran move on our part, because the cop was so nice, came right over to the car, spoke to the unfriendly voice on the other end of the line, and discovered that the gate had been broken all day. This explains why we saw the car driving the wrong way on the on ramp. WHY didn’t they put a sign up or something, though?!?? I mean, not that I would have been able to read it, but I could have google-translated it, or I may have surmised that the gate was broken if there was a sign hanging on it, and if the light to approach it was red, as opposed to “come on through here” green. Anyway, the nice cop lifted the gate for us, and we were FINALLY on our way again. In case you think I’m making up these stories, I slyly took a photo to document the event. Score another point for the American girls! 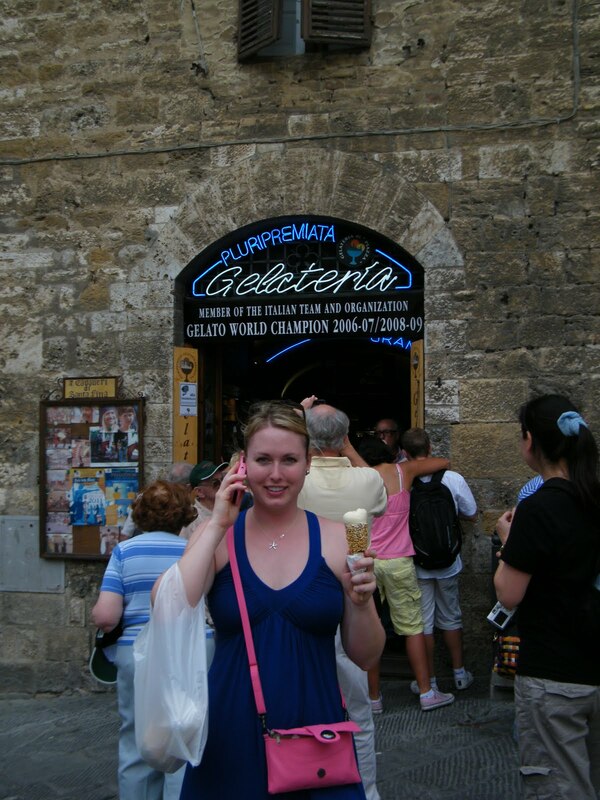 I did a lot of pre-reading to determine what we should do in Tuscany, and the overwhelming reviews I read about a company called Walkabout Tours convinced me that their Best of Tuscany tour was the way to see the highlights of Tuscany, while also getting some local, non-touristy flavor. So, never one to turn down great advice, I signed us up. 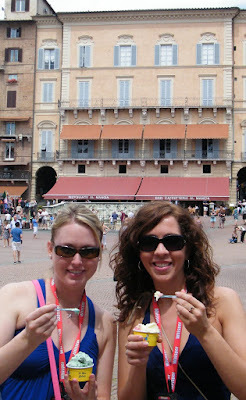 We walked to the train station where we were to meet up with our tour guide and group. 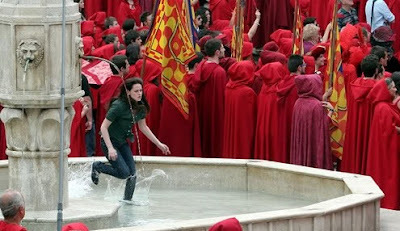 This is when I first realized that the men in Italy are kinda pervy. Or, at least, they act like they’ve never seen a woman before in their lives. Cat-calling, whistling, ogling, nodding enthusiastically as we passed, marriage proposals, declarations of love—we each experienced these things over and over and over during our time in Italy. It was fascinating to me. And I don’t mean that in a good way, boys. So don’t get any ideas. Ick. My favorite place—it’s absolutely breathtaking. The scenery that surrounds it, the cathedral, the stone streets and its ancient buildings. 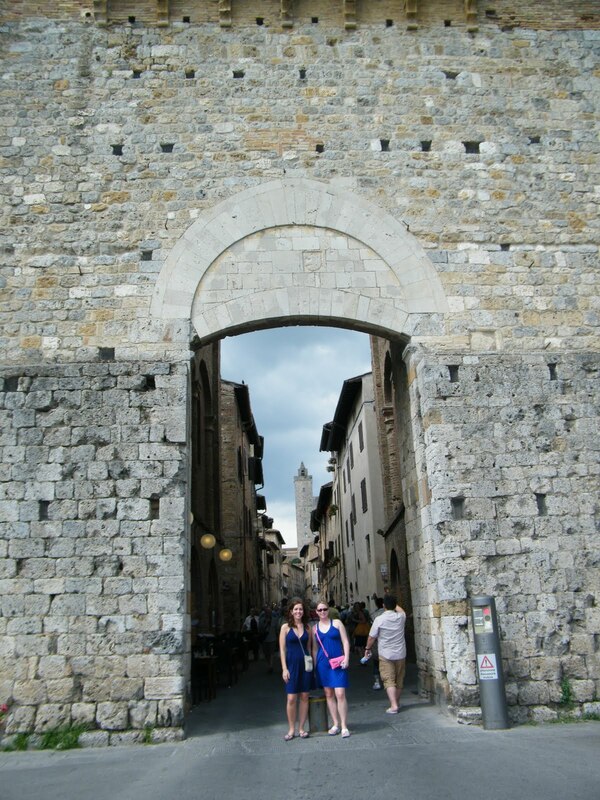 It’s everything you would imagine a Tuscan city to be. Siena felt like a real town, but part of a different world—a simpler one, where you could imagine daily life being lived. 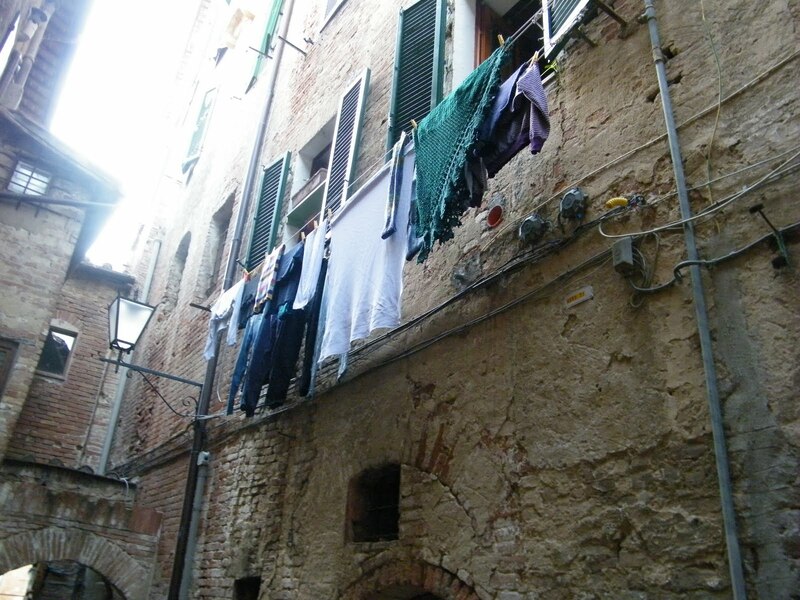 There was laundry hanging outside windows, flags proudly flying outside homes and old men sitting in the city square because that’s probably what they’ve done every morning for as long as they can remember. 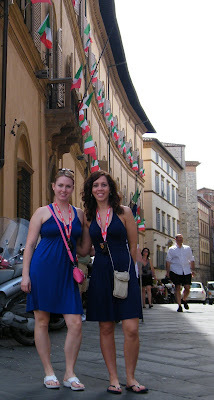 If you want to visit what I think of now as “quintessential Tuscany,” don’t miss out on Siena. Another ancient city that was similar to Siena in look, but not feel. It’s a really gorgeous place, but it felt so touristy. It was hard to imagine that real people, with real lives, actually lived here. Don’t get me wrong—it was beautiful, and I’m glad we went. It just wasn’t Siena. Here I am with my newest weakness (Thank GOD I'm not living in Italy for the summer--I'd need a seatbelt extender on the plane ride home). Breathtaking. The Chianti region is amazing—some of the best olive oil and wine in the world is produced here, and we were lucky enough to tour a vineyard/olive grove, do a wine tasting and eat lunch at an organic farm. 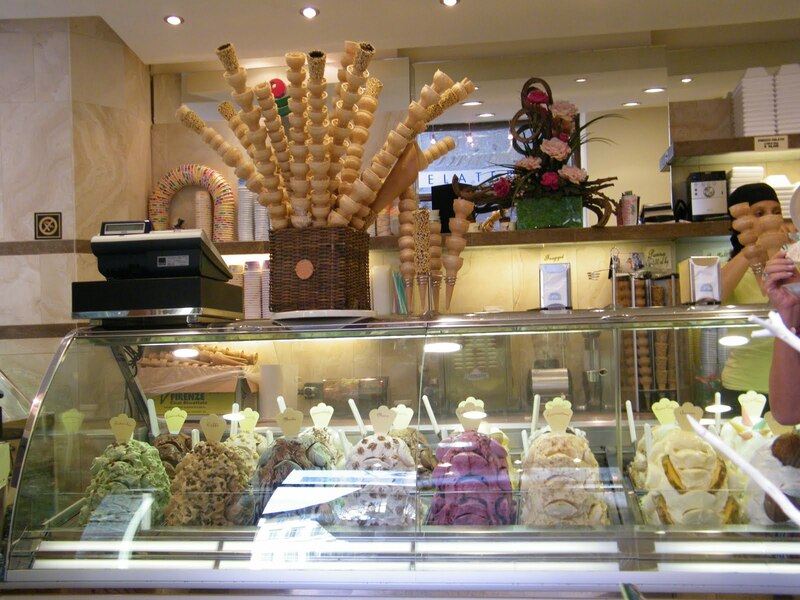 I also bought olive oil and sent it to my dad for Father’s Day from here, and he LOVED it. Buy some! Pisa was my least favorite place in Tuscany, although it was still beautiful—the architecture is out of this world. Except for that little mishap they call the Leaning Tower. What I didn't like about Pisa, in addition to the endless line of vendors hawking their cheap, knockoff Ray Bans, were these T-shirts. Do you think my expression gives me away? Oops. But I Heart New York. So THERE, Pisa. 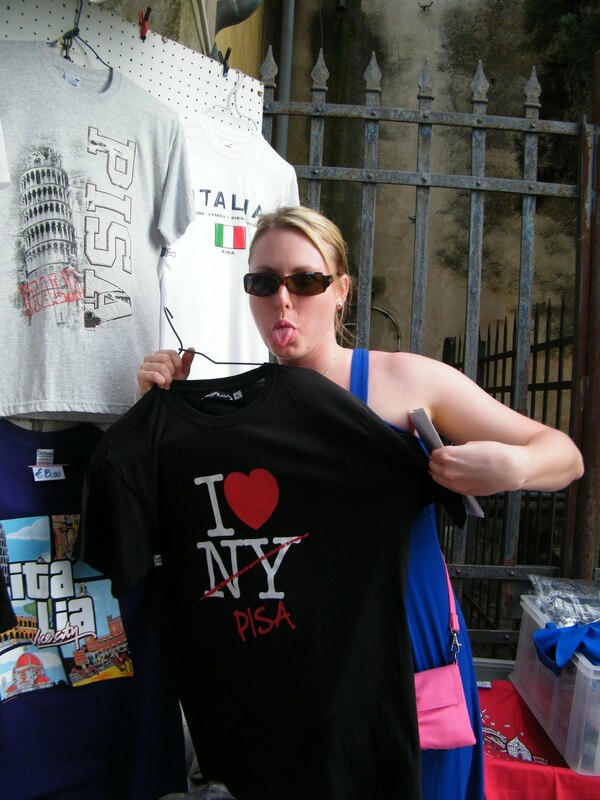 We didn’t spend too much time in Pisa. We got our obligatory picture with the tower (I'm not gonna lie--that was fun), then peaced out. I just want to point out that I took the obligatory picture to the next level. 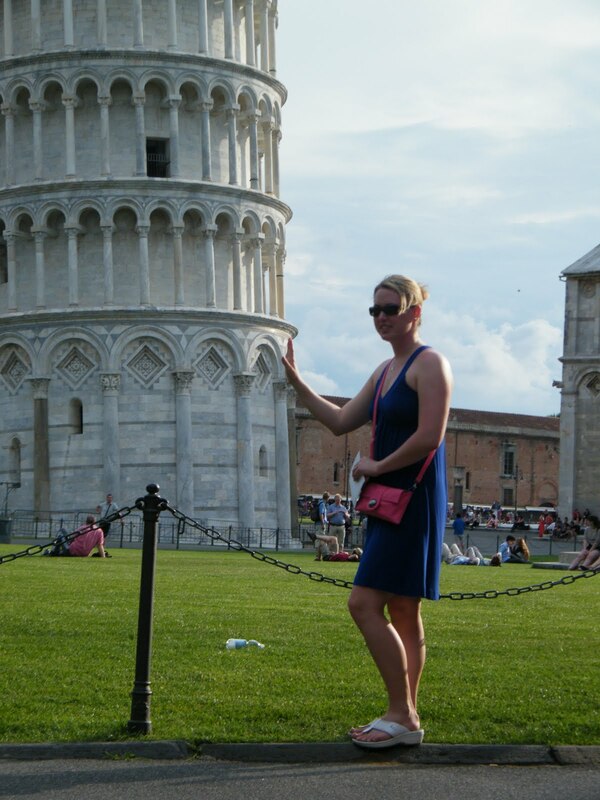 While those other schmucks all took their "look at me--I'm so strong, I'm holding up the tower of Pisa just like everyone else who ever visits," I was on the other side, taking a "Hehehe--I'm pushing it over!" picture. Ok, well once again, I kinda rambled (shocking, I know). In the next (and final—I promise!!) installment, we’ll spend a day just outside Florence on an organic, family farm, taking a cooking class. Then we’ll explore Florence one last time and drive to Cinque Terre on the Italian Riviera for long hikes and days on the beaches of the Mediterranean. 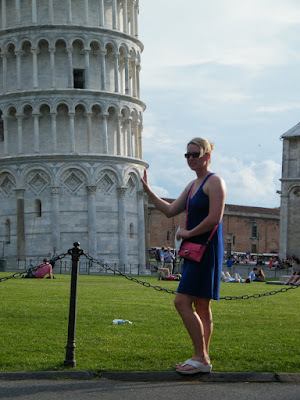 I can't believe Pisa was a month ago already! Also, good job pushing over the tower. You're so strong AND clever ;) Loved your post!